Celebrating 20 years’ coach building of distinction. 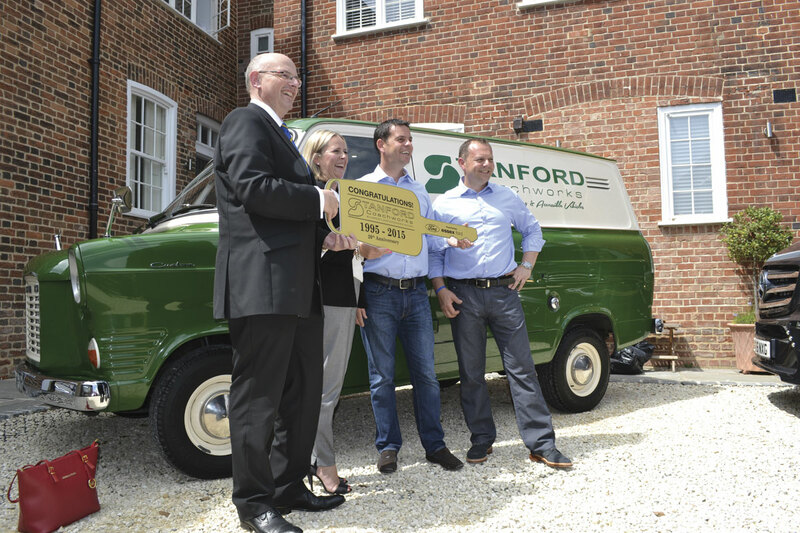 Stanford Coachworks is celebrating 20 years in business this year and to thank their customers and suppliers, they hosted a reception at The Bell Inn, Horndon-on-the-Hill, in Essex. Kirsty went along to meet the team behind this successful company and to find out how it all started. Stanford Coachworks was originally a mechanical garage (Stanford Repairs) based on Stanford-le-Hope High Street, run by Jess Rider, Lee Wiggins and Lee’s dad. Jess and Lee have known each other since they were 18 and their partnership is as strong today as ever. 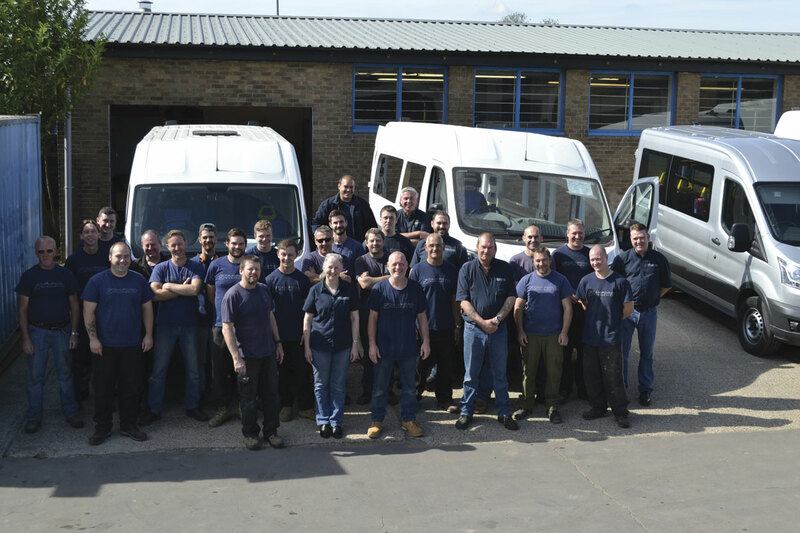 They moved to their current premises in 1994 and the business as we now know it started when a customer came to them to look at a Ricon tail lift on a Transit. Not one to turn business down, they took on the job and were later approached by Ricon’s then MD, Tony Bough, to be a regional service agent. They knew a window fitter and a trim specialist and Stanford Coachworks was born. Jess, Co-Director of the company, explained that they placed an advert in ‘Magic Carpet’ magazine and got a booking. Their first vehicle was a Transit from Essex Ford in Basildon that was sold to Tilbury Taxis on 1 September 1995. 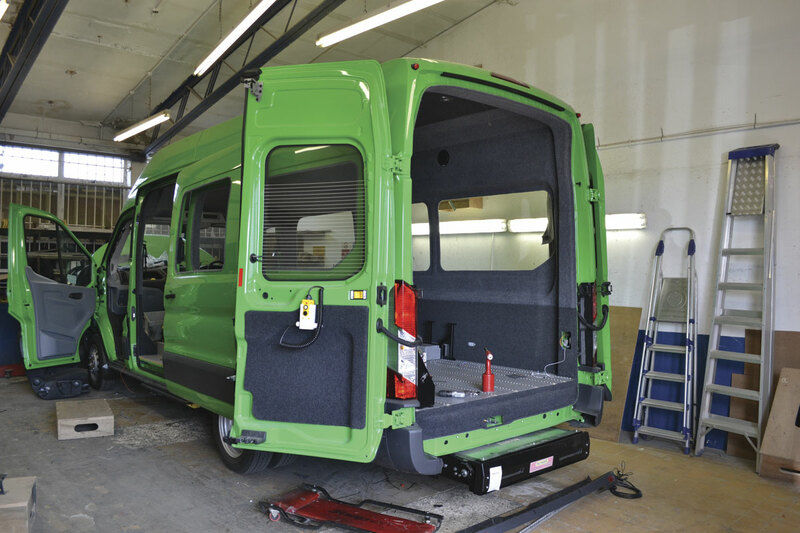 Specialising in Transit conversions, they nicknamed themselves ‘Transversion experts’, focussing on vehicles with Ricon internally mounted lifts. This relationship has continued over their 20 years of trading although they also use Ratcliff and PLS products. Examples of their innovation are the flat floor and super flat floor vehicles that are now their top sellers and unique to them. 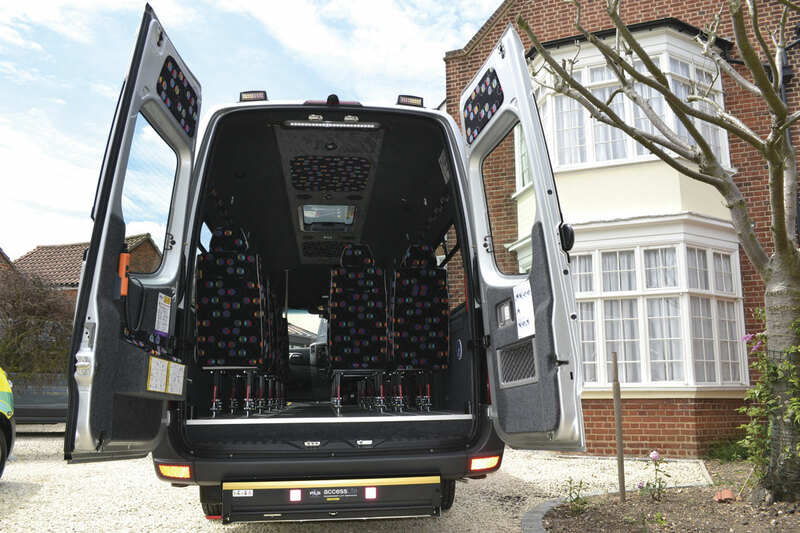 By adding a flat floor, the ‘dead space’ where the wheel arches are becomes obsolete, allowing more space for wheelchairs or seats, depending on the specification. They come fitted with Unwin tracking and the super flat floor has a lift fitted beneath the deck. Dave Wiggins, who joined 15 years ago, has spent three to four months working on a new step. The fold out step which is in common use has just one level; the new product now has more steps so that the actual distance from the ground is greatly reduced. This is key for many of the passengers who will be accessing the vehicles as mobility is often an issue and is something that is taken for granted by those of us that have full freedom of movement. The lightweight system has gas rams for assisted leverage and Stanford have exclusivity of this for three years. 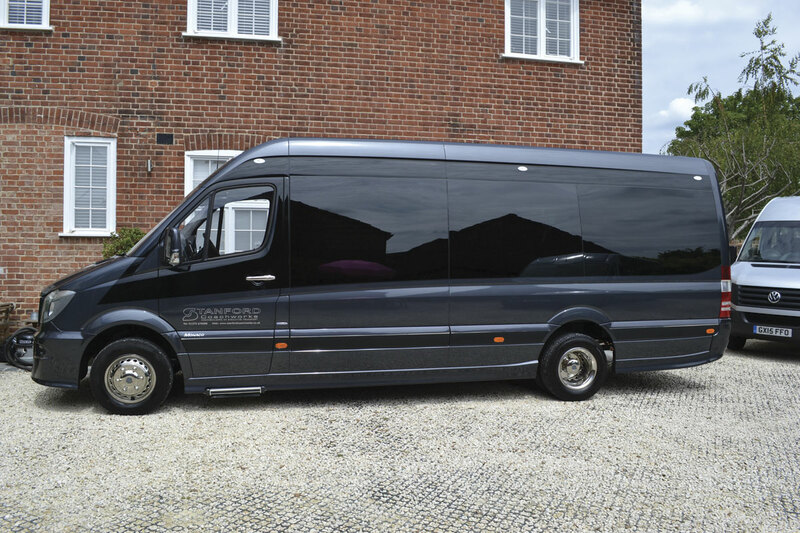 Transits are no longer the core of their business and they are proud to have Type Approval for Mercedes-Benz Sprinters and VW Crafters with the bulk of their conversions being based on the five tonne Sprinter. Obtaining Type Approval was something Jess is proud of and commented that it was a real sense of achievement. The process involved has not been without its problems but Jess explained that a lot of what was required in the new legislation, they were already doing. Further to my recent article on the subject (B&CB 1323, 17 April 2015), Dave explained that although the paperwork situation has improved greatly, the waiting time for testing is now as long as four weeks due to a shortage of VOSA approved testers. He said, ‘The system has gone downhill since we spoke last and we currently have 20 vehicles sitting in the yard waiting to be tested.’ Jess added that they had currently spent over £120,000 on vehicle testing. At the CV Show in April, they had vehicles waiting for test going back to March. They have employed Miranda who takes on the role of processing the IVA applications and as soon as they get the Z number from the vehicle chassis, she starts the application process. This can often be before they actually have the vehicle in their possession in order to reduce the delays in the process. Maximum vehicle production is estimated to be about 450 vehicles a year. 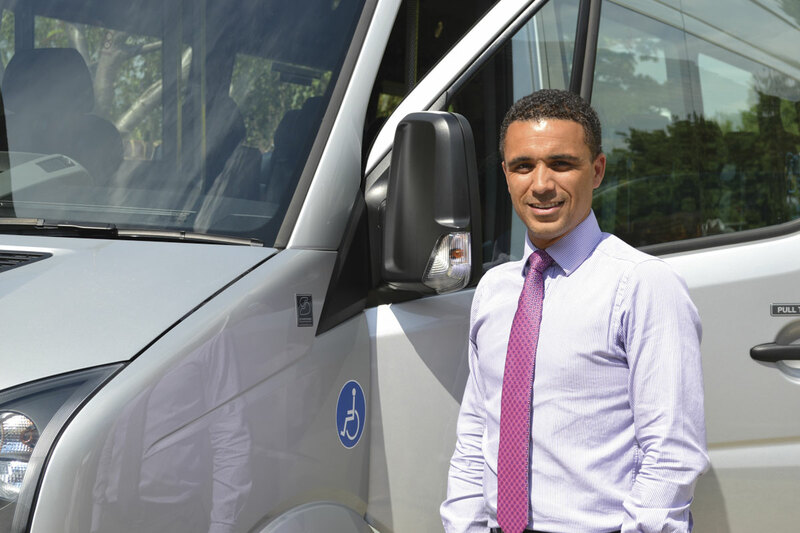 80% of their vehicles are wheelchair accessible, with the remainder quite broadly spread between minibuses, mini coaches and ambulances, although they do have a reputation for covering everything and at the time of my visit, they were adapting a vehicle into a bespoke mobile tyre unit. They have also designed a ‘Jumbulance’ – essentially a giant ambulance that could be parked outside an overstretched A&E department and act as a mobile holding ward, housing four curtained stretcher areas. 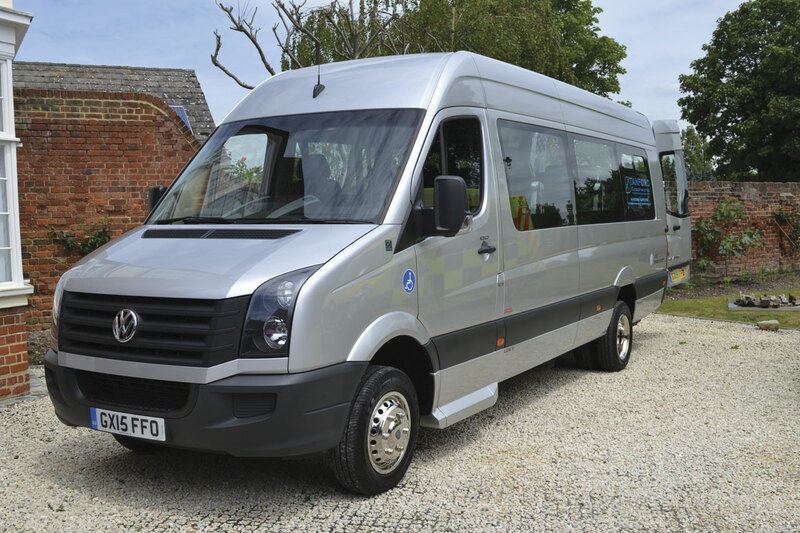 Their latest product and currently on trial with a number of councils, pending orders, is a 22-seat coach built Sprinter. This broad spread has seen them through a number of recessions, helping to limit their peaks and troughs and despite employing 40 members of staff they were able to keep everybody in full time employment during austere times. Some of the credit for this has to be awarded to their sales reps and I was able to speak with a couple of them. Their belief that hard work pays off is evident and staff are incentivised on each job. Working in teams of two, the staff are multi-skilled to work in different areas and are allocated a period of time in which to finish each section. If they complete the job quicker by working more days or longer hours, they reap the rewards. They also offer on the job training and new starters or those taking on additional skills go through a ‘traffic light’ training programme. They realise that what they do is a dying trade, having spoken to local colleges regarding apprenticeships, to discover that people tend to want to specialise now in one discipline. There are no plans to expand as there is sufficient space on site to suit demand. One of the business’s core values is to keep borrowing to a minimum and they are proud of the fact that they own their premises. 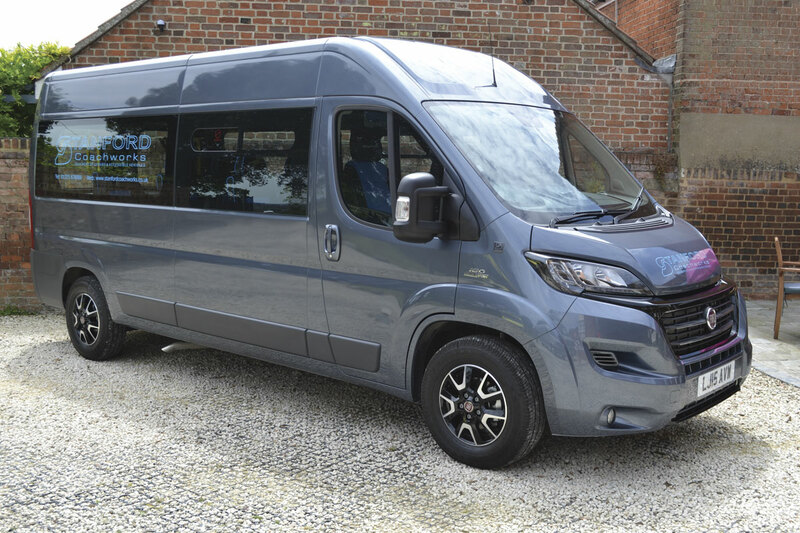 There is no requirement for a showroom but they do have a number of demonstrators available as well as Citroen Relay long wheelbases in stock. 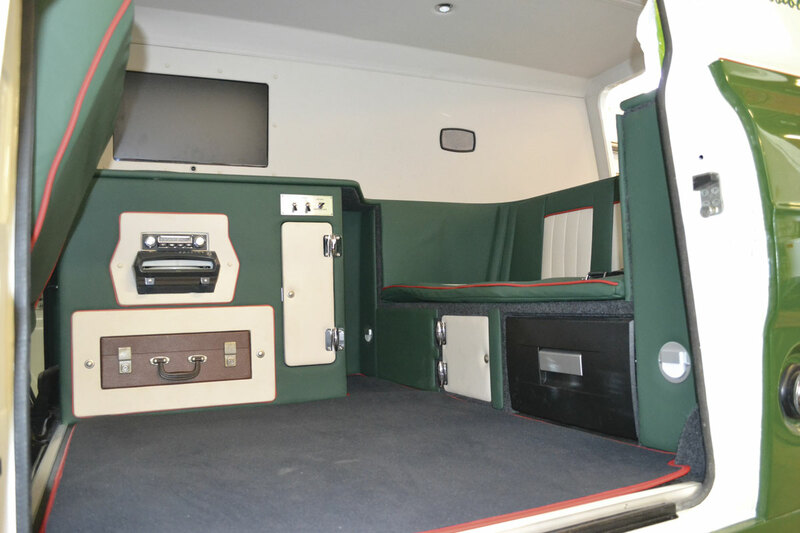 The attention to detail on their vehicles stands out and it is the little things like making sure that the head lining in the cab is the same as that in the rear of the vehicle, and covering the driver seat mountings which makes the difference. It is this detail and the bespoke service that they offer that has won them repeat business over the years. They are the preferred suppliers to a number of councils, local authorities and companies, including Burnt Tree, London Hire and the Lord’s Taverners charity, many of whom have their own specification that they have worked on together. They have also forged long lasting relationships with a number of suppliers and have worked with Koller, Ricon and Eberspacher since the beginning. Representatives from a number of these businesses were in attendance at the event, as well as from NMI, Phoenix Seating and Passenger Lift Services. They recently employed Jodi Turpin to take on the marketing role and organising the anniversary event was part of her remit. Now that this has been successfully staged, she will concentrate on Stanford’s own show at Brand’s Hatch. This year’s, on 29 September, will be their third year at the Kent racing circuit and will build on last year’s successful training workshops which Rob Orchard covered (B&CB 1297, 10 October 2014). 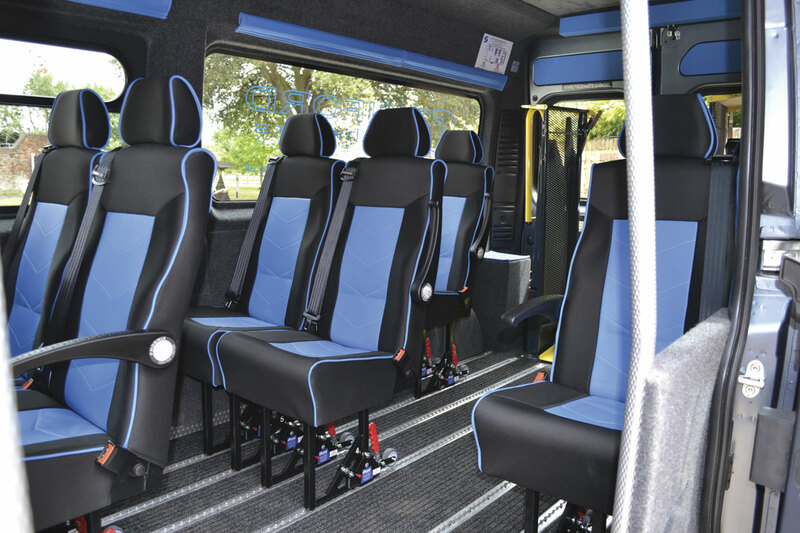 The company can usually also be found at the main bus and coach show each year and were part of Rescroft’s accessibility area at last year’s Euro Bus Expo. 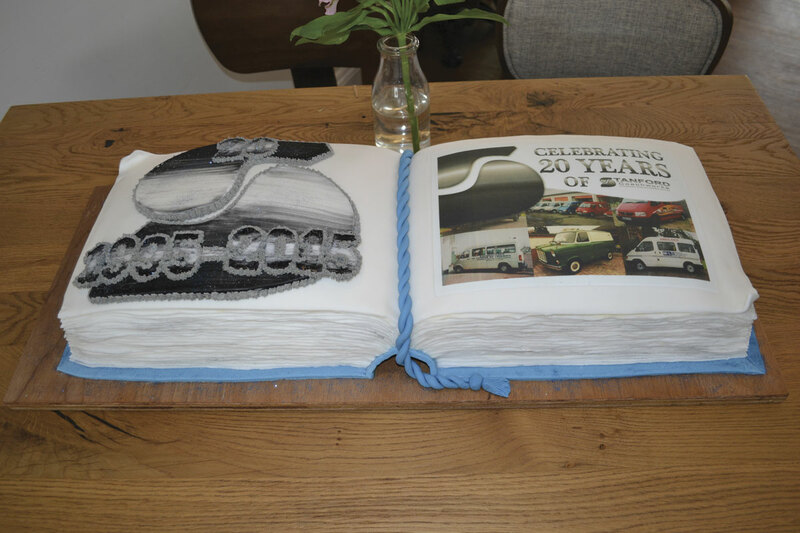 The anniversary party was well attended by suppliers, customers, co-workers, family and friends of Stanford Coachworks. Everybody that I talked to spoke very highly of Jess and Lee and of the company in general, so it seemed only fitting that the sun should beam down on their anniversary celebrations. Guests were able to view a number of demonstrator vehicles in the grounds of the reception venue, whilst enjoying canapés and a fully stocked bar. Everyone invited left with a gift bag and a number of suppliers presented gifts of their own. 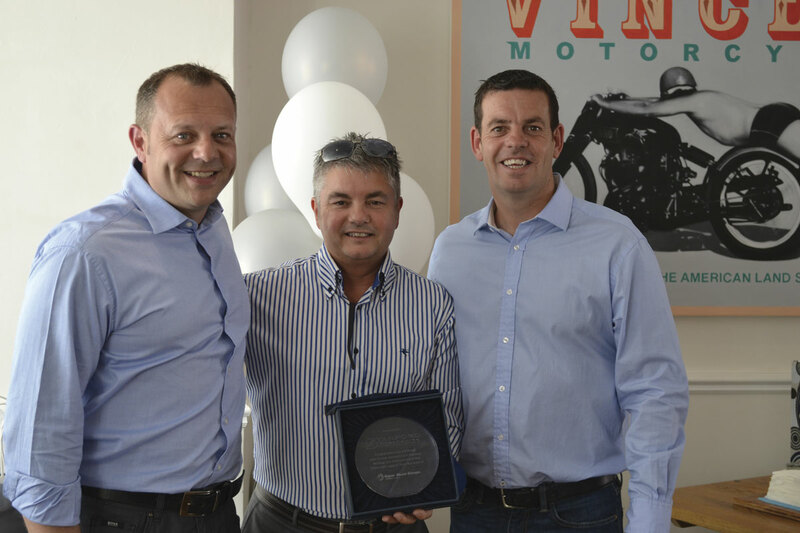 What was very evident was the warmth and goodwill that was bestowed upon the team at Stanford Coachworks and I hope that will continue for many years.